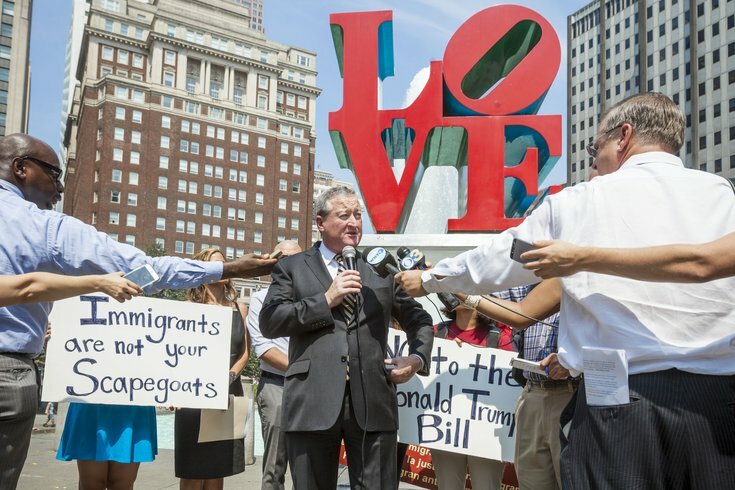 Democratic mayoral nominee Jim Kenney re-iterated his support of Philadelphia as a sanctuary city Wednesday despite congressional legislation targeting cities that fail to enforce U.S. Immigration and Customs Enforcement requests. The United Way of Greater Philadelphia and Southern New Jersey announced Tuesday that Democrat Jim Kenney and Republican Melissa Murray Bailey will appear at a mayoral debate on Sept. 29. Invitations to the event, dubbed "The Future of Philadelphia: A Mayoral Town Hall Debate," also have been extended to third-party candidates Osborne Hart, Jim Foster and Boris Kindij. The debate will be held at 7 p.m. at the DoubleTree Hotel in Center City. 6ABC will moderate the forum, which is free and open to the public. Registration is required. Attendees can submit questions for the candidates when they complete their registration online. "As the Mayoral Race continues, we're proud to have the opportunity to host this important discussion about critical issues that affect the future of all Philadelphians – particularly those that will improve education, financial stability, health and basic needs like food, shelter and safety for our most vulnerable neighbors," said Jim Cawley, president of Philadelphia's United Way branch. Kenney ran away with the Democratic nomination in the mayoral primary, defeating a slew of candidates that included State Sen. Anthony Hardy Williams and former Philadelphia District Attorney Lynne Abraham. Bailey ran unopposed in the Republican mayoral primary.